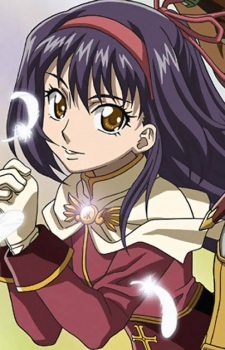 The love interest of Roan, Yufa (ユーファ, Yūfa?, voiced by Nana Mizuki) is an acolyte and Roan's childhood friend. Though she puts on a smile for Roan, it's obvious she's still mourning the loss of her older brother, Keough. When Keough suddenly returns to life as an evil being, she becomes confused and doesn't know whether or not to fight her brother or protect him. Later, in an effort to save the souls under the control of the Moonlight Flower in Payon, she becomes a Priestess. Eventually, Roan's ignorance and arrogance pushes Yufa away and prompts her to leave the group (and Roan) behind for her brother, Keough. Keough eventually corrupts Yufa by removing her soul crystal, something that seems to give her the ability to stay pure, and is also consequently one of the key items of Dark Lord's revival. After stabbing Roan in her corrupt state, Keough comes to her in a vision and tells her that he must leave her... but that Roan would protect her in his absence. This vision broke Dark Lord's corruption, and freed Yufa to allow her to see what she had done. Holding the dying Roan in her arms, Yufa kissed her childhood love at last. This kiss of true love destroyed the cursed ruby ailing Roan, allowing the two to stand together against Dark Lord. With the help of her friends and Roan, Yufa sealed Dark Lord away with a Magnus Exorcismus spell. At the end of the series, it is implied that Roan and Yufa married.